Sweet and Spicy - This pineapple salsa add fresh tropical flavor to any dish. I love having salsas around! They are a great go-to for adding a bright spicy flavor to anything. Traditional salsa fresca is something that I almost always have in the fridge for eating on eggs – or basically anything. 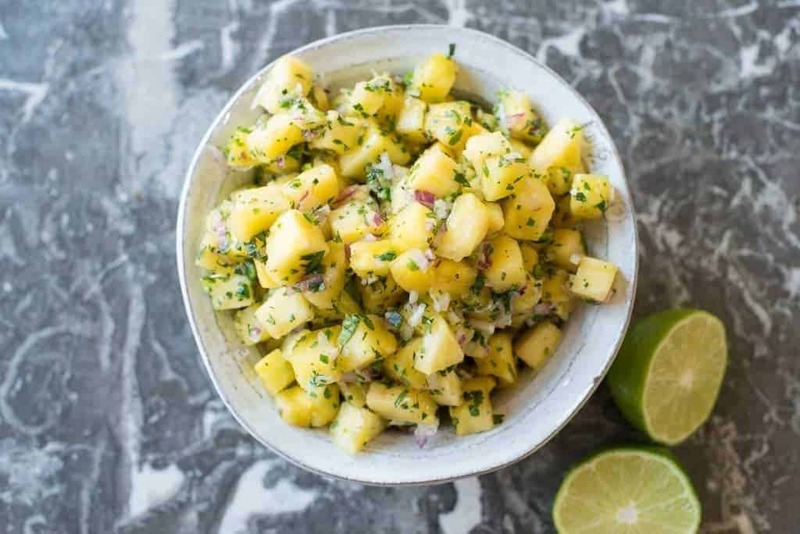 This pineapple salsa is a fun, tropical alternative to salsa fresca! Sweet and Spicy – This pineapple salsa add fresh tropical flavor to any dish. The sweet pineapple paired with savory ingredients creates a combo that can’t be beaten. The beauty of making your own salsa is that you can dial in the spice to just the level you want it! Laura uses serrano peppers in this salsa. They are spicier than jalapenos and have a sharp bite to them. While I do like a bit of spice, I’m not that adventurous. Jalapenos are more my speed. In this salsa, however, even the serranos are toned down by the sweetness of the pineapple. What do you like? Not sure what to put this on? Make the Jerk Chicken Beast Bowl with Jamaican Rice and Fried Plantains! Talk about an amazing flavor combination, this one is a favorite. 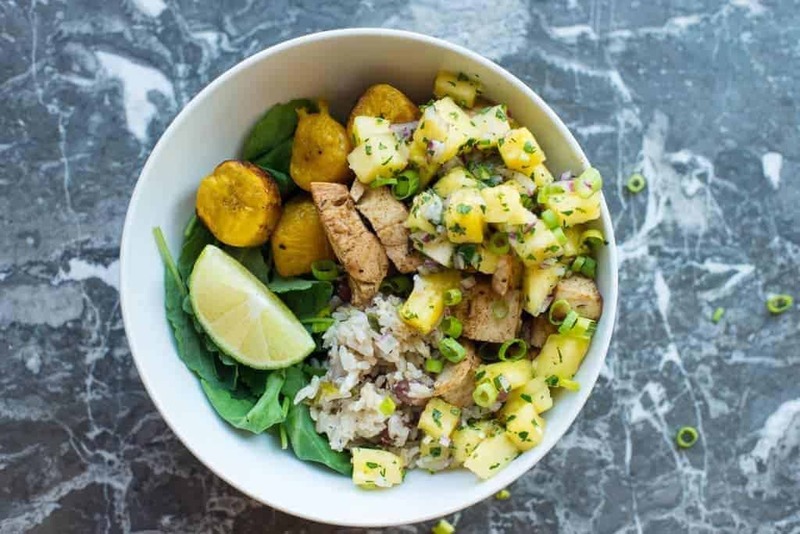 Jerk Chicken Beast Bowl with Jamaican Rice and Plantains – topped with spicy Pineapple Salsa! If you like our recipes please follow us on your favorite social media. Find us on Facebook and Instagram. This sweet and spicy tropical salsa is a bright addition to most any dish. It pairs really well with grilled chicken or fish. Add all of the ingredients to a bowl and stir.